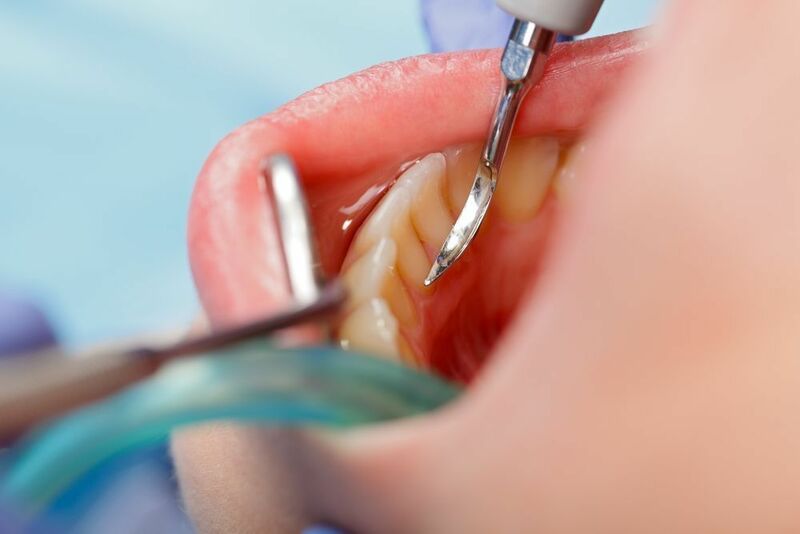 Often referred to as deep cleaning, scaling and root planing is a non-surgical procedure that helps treat gum disease by removing plaque and tartar from the root surfaces of the teeth and below the gum line. Dr. Navid Baradarian and Dr. Lawrence Tesser are skilled periodontists in Manhattan and New York, NY, who can administer this treatment gently and efficiently. Our doctors will also help you manage your future periodontal health. When plaque becomes trapped under the gum line, it harbors bacteria and causes the gum tissue to become inflamed. Over time, toxins in the bacteria can cause deterioration of the jawbone, leading to periodontal pockets and tooth loss. When diagnosed in its early stages, periodontal disease can be treated with non-surgical therapy. Similar to a routine dental cleaning, scaling and root planing cleans even deeper into the gum line, eliminating plaque and bacteria and effectively smoothing the root surfaces of the teeth to deter plaque from reattaching. Periodontal disease is a chronic and systemic infection. If left untreated, symptoms will worsen over time, affecting your oral and overall health. The same bacteria found in the oral cavity enter your bloodstream and travel throughout the body. Clinical studies have proven there is a direct link between periodontal disease and other serious health issues, such as heart disease and stroke. Patients with diabetes or immune-related issues are at a higher risk for developing gum disease. Additionally, patients can be genetically predisposed to periodontal problems. Regular dental cleanings are important for everyone, but patients at high risk for gum disease should be especially diligent when it comes to routine oral care and prevention. To diagnose your gum health, Dr. Baradarian will measure the pocket depths around each tooth using a periodontal probe. A healthy tooth will measure approximately one to three millimeters. Early signs of gingivitis are indicated by a four-millimeter pocket. Anything that measures five millimeters or above denotes periodontal disease. X-rays will be taken to evaluate the extent of gingivitis or periodontal disease. Mild to moderate periodontal disease can be treated with scaling and root planing. If Dr. Baradarian determines that this non-surgical therapy is right for you, he will first numb the teeth and gums with local anesthesia. Using a combination of ultrasonic scalers and hand instruments, your teeth and roots will be thoroughly cleaned and disinfected. Since there are no incisions, stitches are not necessary. Follow Proper Oral Hygiene: Maintaining good oral hygiene habits will help keep your teeth and gums healthy. An extra soft toothbrush can help effectively remove plaque buildup without discomfort. Flossing at least once per day will help keep the areas between your teeth clean. Use Topical Fluoride Gel: Available by prescription, this gel can be used twice a day to reduce sensitivity and help strengthen tooth enamel. Brush with a Desensitizing Toothpaste: The use of an over-the-counter desensitizing toothpaste can help decrease discomfort during the healing period. Approximately four to six weeks after your scaling and root planing procedure, Dr. Baradarian will re-evaluate your periodontal health. During this visit, he will determine if further treatment, such as surgical intervention, antibiotic therapy, or additional scaling, is necessary. "Our team will be happy to help you identify a combination of tools that will help keep your teeth clean between visits." Once we achieve the desired baseline of health, it is important to continue routine cleanings to prevent the growth of future bacteria. Many patients who are prone to periodontal disease require more frequent cleanings, typically at three-month intervals. Dr. Baradarian will help you determine a periodontal maintenance schedule that is right for your situation. *Disclaimer results are not guaranteed, may not be permanent and can vary per individual. Some images are models, not actual patients. If yes, please fill out all the information below. I understand that payment is due in full at the time of treatment unless arrangements have been made. I also understand that if his office participates with my insurance that I am responsible for payment of all services rendered and also responsible for paying any co-payments, deductables and any services that my insurance does not cover and anything above the maximum allowance.